mahjongger is similar to the ancient ?hinese game of mahjong solitaire. Game is intended for children and promotes development of figurative thinking. Puzzles are generated randomly during game. Levels are unique. Puzzle never repeat itself, at each level. The goal of the game is to eliminate all tiles on the board by matching pairs of free tiles. ...... You collect points by matching pairs of tiles. 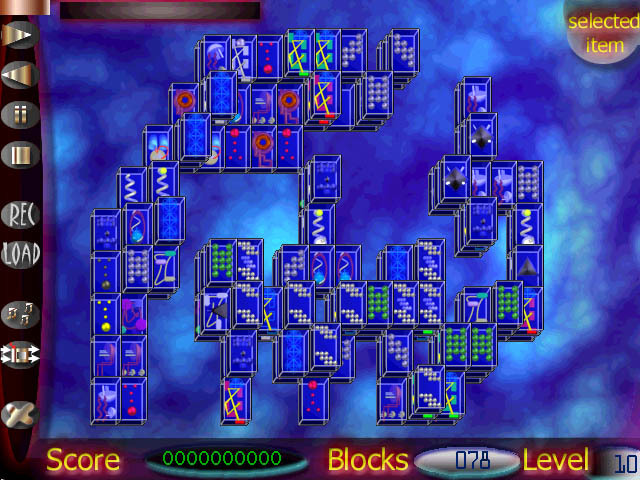 You lose the game if there is no possible move left (you cannot shuffle the tiles again in this case). You win the game if all tiles are eliminated from the board. If you manage this in a good time, you can enter your name into the highscore list. Dynamically generated puzzle at each level.just press RESTART for creation of a new puzzle in the game. Qweas is providing links to Mahjongger 1.2.002 as a courtesy, and makes no representations regarding Mahjongger or any other applications or any information related thereto. Any questions, complaints or claims regarding this application Mahjongger 1.2.002 must be directed to the appropriate software vendor. You may click the publisher link of Mahjongger on the top of this page to get more details about the vendor.